Astro is a project aimed at creating a design system for EUC at VMware to bring a consistent level of quality to the Workspace ONE console. By doing so, we want to address gaps in the framework and allow for updating the pattern library as per project requirements. The End User Computing unit at VMware has a variety of products under its purview including administrator consoles such as AirWatch, Horizon 7, and Horizon Enzo. Most of these consoles run on separate design systems and UI frameworks such as MVC2, MVC4 and ATK (angular). One of EUC's goals is to move towards a unified console called Workspace ONE combining the functionalities and use cases for all its console to provides a seamless user experience. This means that we need a Design System and UI Framework flexible to support all our use cases. We used Brad Frost's Atomic Design Model to break our old consoles down into their basic components, which could be reused throughout the new console. These components could be combined into more complex components, depending on their purpose. Over the next several months, I worked with the Visual Designer on the project on the interaction design and visual updates to the UI elements and controls. Since we had multiple pattern libraries, we had to check for unique use cases amongst all of them and see where these elements would be used. These elements had to be flexible enough to be used within a variety of use cases. We laid out rules for when an element or control should be used, how it should be used and also interactions for each component. Since this document was for both the designers consuming the elements in their designs and the developers building the library, we had two target audiences. Once we had a comprehensive list of elements and controls, it was time to consolidate our layouts. For each template, I created an architecture diagram based on when and where it is used. 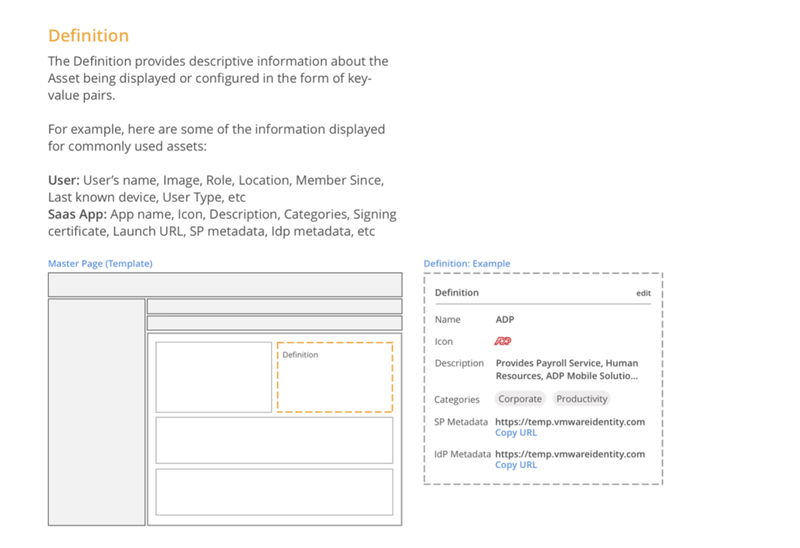 I identified possible element and control in the layout, and provided multiple examples. After that, I worked with the Visual Designer to finalize each template. Astro is an ongoing project and I have worked on it for almost a year. Working on this project has been exciting, challenging, and sometimes frustrating. There are so many moving pieces that we have to be constantly vigilant for anything that could disrupt the effort. This project involves close collaboration with several development teams and several technologies, and it has been amazing how everyone is coming together and coordinating their efforts! This project is helping me learn how to shuffle priorities based on the need of the hour and quickly identify whatever needs to be done as soon as possible. At the end of the day, the pattern library supports our products and anything that needs to ship to users takes precedence.